Here we have a Wire press kit that was sent in the late seventies to 'Muziek Parade' a montly music magazine in Holland. 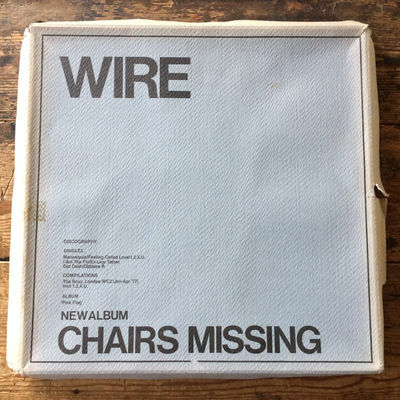 This kit contains the first 3 singles and 2 albums of Wire and the Roxy London WC 2 LP. 8 promo pictures; 2 full colour and 6 black & white matted, and an eight pages booklet (incl. the cover) with articles/reviews from Melody Maker, Record Mirror and Cashbox. All vinyl is mint, unplayed, the singles have a factory sample sticker on one label, 2 Wire LPs have a Gold coloured Not For Sale stamp and the Roxy London LP a factory sample sticker on the backside. 4: Album Pink Flag - mint- vinyl, cover near mint (2 very light corner bumps, nothing serious), printed innersleeve ex+/nm, minor wear on one side in the middle and under (probably caused by the record, during shipping). - ‎– SHSP 4076, ‎– 0C 062-06 564, ‎– SHSP 4076(I) first. W/ lilac inner. This the 1st original UK issue pressed in 1978. There is speculation that the record is identical to those appearing with the black and white inner that was distributed immediately after this, and that this is because Wire intended the inner to be black and white and thus had the lilac inner replaced. 6: album The Roxy London WC2, mint vinyl, cover mint-, printed innersleeve near mint, minor wear on each side in the middle (probably caused by the record, during shipping). On January 1st 1977 The Roxy opened exclusively for the New Wave. There was nowhere else for most of the groups to play. We promoted the music until April 23rd, and enjoyed it. Recording by Manor Mobile. Mixed in London. Produced for Sisterdale (P) 1977 Sisterdale Ltd. The original edition with custom picture labels, picture inner sleeve (SHP 4069 (1) and no barcode. 7: 8 promotional photo's; two full colour and six black/white matted, size 10 X 8 inch (+/- 25 x 20 cm) all in perfect condition. 8: booklet (8 pages incl. cover) in perfect condition. The 'box' is made of maybe 250 grammes paper, 2 loose layers, no carton and the outher one has serious wear, split on corners with a staple in it, and one tear in the middle of one side. the red one is ok but has also a tear at one side in the middle just like the grey one. In despite of all that, a very rare item that probably or never will turn up again for sale as a complete kit. REGISTERED and insured SHIPPING, don't use the check out but wait for my invoice, because it can't be send for £9.50 from Holland. We hope you will be happy with our service and understand that once we have despatched your order, delivery times are out of our hands (we always ship the same working day as payment is received, shipping date is printed on the poststamp). If you are not happy for any reason or are considering leaving us negative feedback or poor scores please contact us to discuss any issues as we are sure that most issues can be resolved to the satisfaction of both parties.